Families struggle every day with parenting and lack of support. Find connection, relationships, and basic principles that can make a difference in your home and the world. 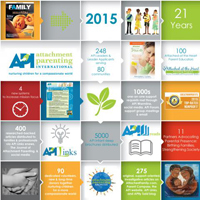 "Attached at the Heart" is the definitive resource on Attachment Parenting, refined through 25 years of research and parent-to-parent support. Now this primary text for AP leaders has been released in an updated edition. Purchase it from your favorite retailer. Follow the API Blog for real life parenting stories, helpful parenting information, and encouragement. when we strengthen families, we nurture and fulfill our children's need for trust, respect, and affection, and ultimately provide a lifelong foundation for healthy, enduring relationships. Join a network of like-minded parents striving to parent children in a peaceful, empathic way. is to educate and support all parents in raising secure, joyful, and empathic children in order to strengthen families and create a more compassionate world. Find your Support Group below, or visit the AP Support Groups Listing page for the complete list.